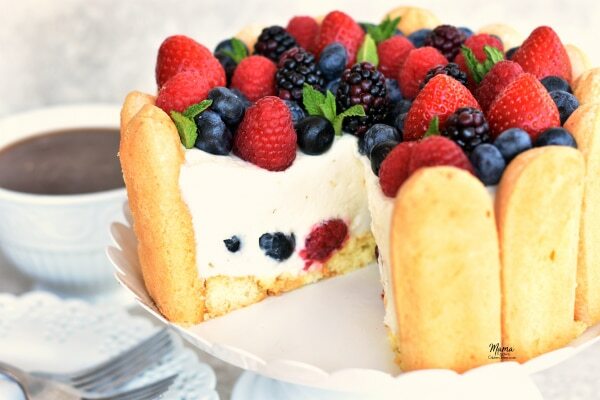 Lemon Berry Charlotte Cake. 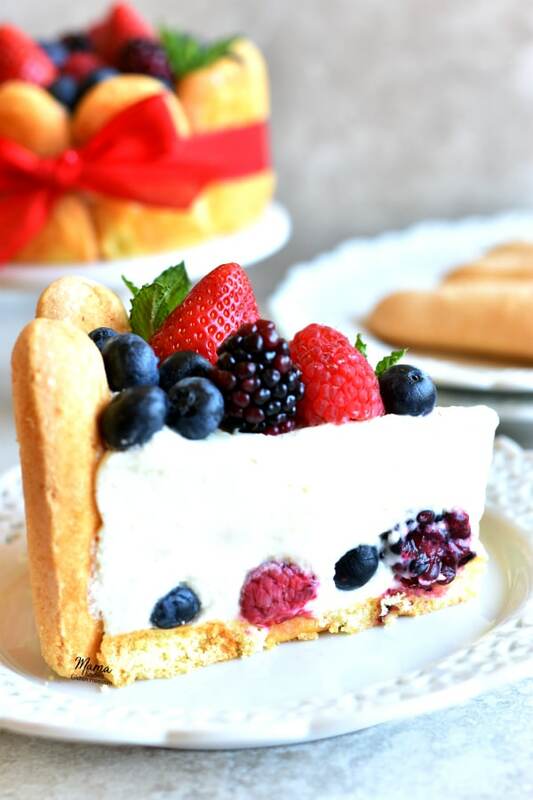 An easy gluten-free no-bake dessert with layers of fresh berries, lemon mousse, and Schär Ladyfingers. Disclosure: This recipe is sponsored by Schär. The opinions are my own. 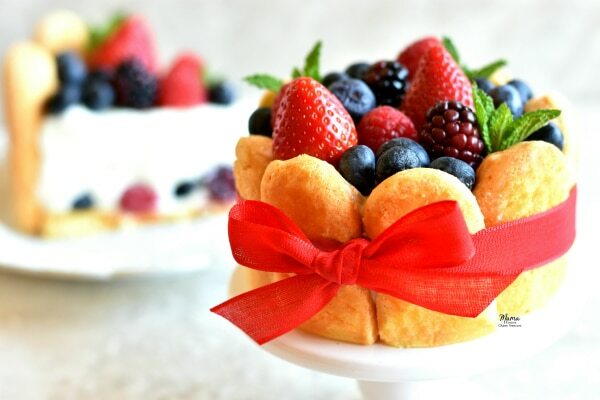 When I think of Spring desserts, I think about beautiful fresh berries. One of my favorite flavor pairings is lemon and berries. I knew that I wanted to make a new Spring dessert for Easter. I will be doing a lot of cooking for my family on Easter, so I wanted a dessert that would be easy, could be made ahead of time, but also be a beautiful dessert my whole family would enjoy. I had seen beautiful Charlotte Russe Cakes before in bakeries, and I decided that I would try and create a simplified gluten-free version. This no-bake lemon berry mousse cake is inspired by a classic French dessert called a Charlotte Russe Cake, also known as a Charlotte cake. A Charlotte cake is traditionally made with ladyfingers and Bavarian cream. This recipe is a simplified version of the classic Charlotte cake made with an easy lemon mousse. Do not be intimidated by the look of this beautiful cake. I promise it is easier to make than it looks. Seriously, with just a few easy steps that I will guide you through, you can make this show-stopping gluten-free dessert. One of the most important parts of this no-bake dessert is the ladyfinger cookies. They are both the cake and the crust of this dessert. The cookies are easily transformed into the crust of this cake by being dipped into a lemon flavored simple syrup. Schär’s gluten-free ladyfinger cookies are a traditional Italian cookie. They are delicate and have a light flavor of lemon and vanilla. The popular Italian dessert Tiramisu is made with ladyfingers. Schär’s gluten-free ladyfinger cookies were the perfect texture for the Charlotte cake. 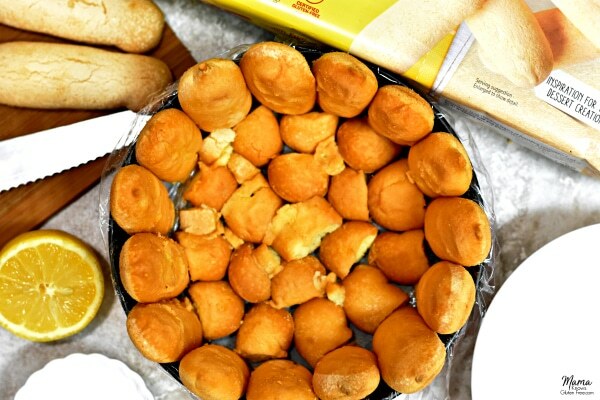 You will need a spring-form pan. You can use a 9″, 7″ or make mini cakes with 4″ pans. Trace the bottom of your pan on parchment paper. Cut out the circle to line the bottom of the pan. Using plastic wrap, line the sides of your spring-form pan. Next, make the simple syrup. In a small bowl add 1 cup of warm water, 1 tablespoon of sugar and 2 tablespoons of lemon juice. Stir until the sugar is fully dissolved. Make sure your bowl is big enough to dip the ladyfinger cookies in. The ladyfinger cookies need to be trimmed to fit correctly (flat end down) in the spring-form pan. Using a serrated knife cut off about 1 inch of the bottom of the cookie. You will see a slight indent towards the bottom of the cookie and that is where you will trim the cookie. Save the end cookie pieces to be used for the bottom crust. 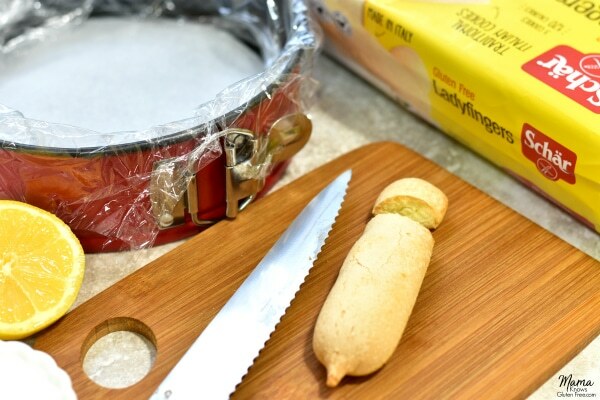 Dip the rounded sugared side of the ladyfinger cookie into the simple syrup and then place upright in the spring-form pan to start forming the circular cookie crust. Make sure the flat side of the cookies is touching the sides of the pan. You will dip each ladyfinger cookie into the simple syrup. Line the bottom of the pan with the dipped ladyfinger cookies. Place the cookies flat-side facing out touching the sides and bottom of the pan. Also, dip the trimmed pieces in the simple syrup and use the pieces to fill in the spaces between the cookies in the bottom of the pan. Boil 1 cup of water in a glass measuring cup in the microwave on on the stove top. Add 1 packet of Knox gelatin to the hot water and stir until it is fully dissolved. In a large bowl using a standup mixer or hand mixer start to beat the heavy whipping cream, 1/2 cup of lemon juice and powdered sugar on medium/high speed until stiff peaks form. Add the cooled liquid gelatin mixture to the cream and beat until thick. For the first layer, pour half of the lemon mousse into the ladyfinger-lined pan. For the second layer add fresh berries. I recommend blueberries, blackberries, and raspberries. For the final layer pour the rest of the lemon mousse on top of the berries and smooth the top with a spatula or back of a spoon. Cover the cake with plastic wrap and refrigerate for at least 4 hours. I recommend refrigerating overnight for best results. To serve, remove springform walls, plastic wrap and top with more berries. 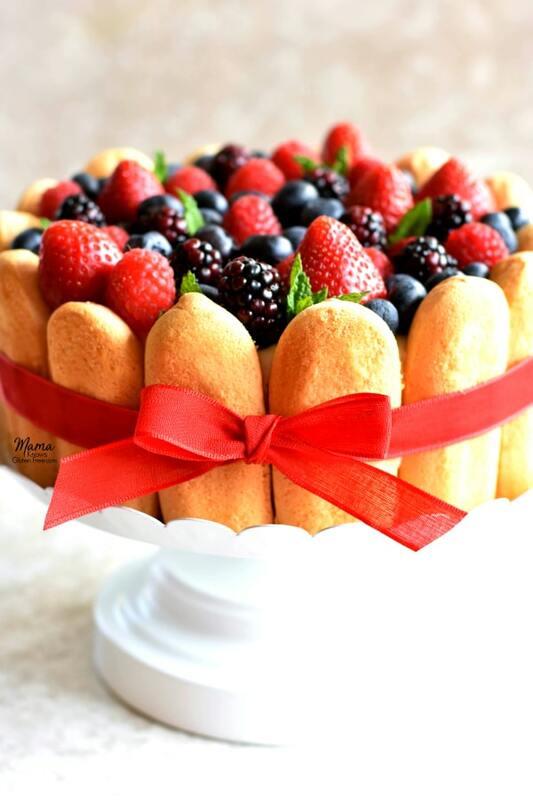 I recommend that you start with placing your largest berries first on the cake and then filling in the rest of the cake with the smaller berries. I started with the strawberries, then added the blackberries, then the raspberries and filled in the rest with the blueberries. I also added fresh mint leaves as a garnish. The cake can also be covered and stored for several days. 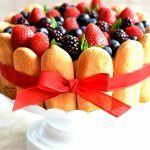 This Lemon Berry Charlotte Cake is an easy no-bake gluten-free dessert that can be made up ahead of time. 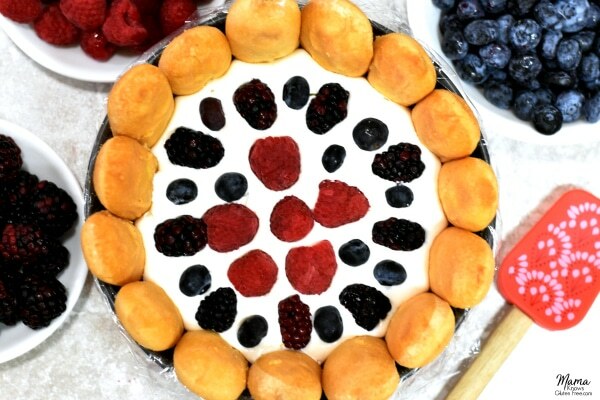 It is a light and sweet dessert made with layers of fresh berries, lemon mousse, and Schär gluten-free Ladyfingers. This Lemon Berry Charlotte Cake would be perfect for your Spring and Easter celebrations. Looking for another easy no-bake dessert? 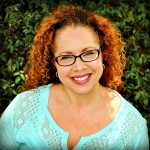 Try my Gluten-Free No-Bake Red Velvet Cheesecake. Using plastic wrap, line the sides of your spring-form pan. Please see photo above for an example. The ladyfinger cookies need to be trimmed to fit correctly (flat end down) in the spring-form pan. Using a serrated knife cut off about 1 inch of the bottom of the cookie. You will see a slight indent towards the bottom of the cookie and that is where you will trim the cookie. Save the end cookie pieces to be used for the bottom crust. Please see the photos above for an example. Dip the rounded sugared side of the ladyfinger cookie into the simple syrup and then place upright in the spring-form pan with the flat side touching the side of the pan to start forming the circular cookie crust. You will dip each ladyfinger cookie into the simple syrup. Please see the photo above for an example. Line the bottom of the pan with the dipped ladyfinger cookies. Place the cookies flat-side facing out touching the sides of the pan. Also, dip the trimmed pieces in the simple syrup and use the pieces to fill in the spaces between the cookies in the bottom of the pan. Please see the photo above for an example. Boil 1 cup of water in a glass measuring cup in the microwave on on the stove top. Add 1 packet of Knox gelatin to the hot water and stir until it is fully dissolved. Allow the mixture to cool but not to become solid. In a large bowl using a standup mixer or hand mixer start to beat heavy whipping cream, 1/2 cup of lemon juice and powdered sugar on medium speed until stiff peaks form. For the second layer add fresh berries. I recommend blueberries, blackberries, and raspberries. Cover the cake with plastic wrap and refrigerate for at least 4 hours and firm. I highly recommend refrigerating overnight for best results. To serve, remove springform walls, plastic wrap and top with more berries. I recommend that you start with placing your largest berries first on the cake and then filling in the rest of the cake with the smaller berries. I started with the strawberries, then added the blackberries, then the raspberries and filled in the rest with the blueberries. I also added fresh mint leaves as a garnish too. The cake can be covered and stored for several days.